Made in heaven, when we weren’t even paying that much attention. 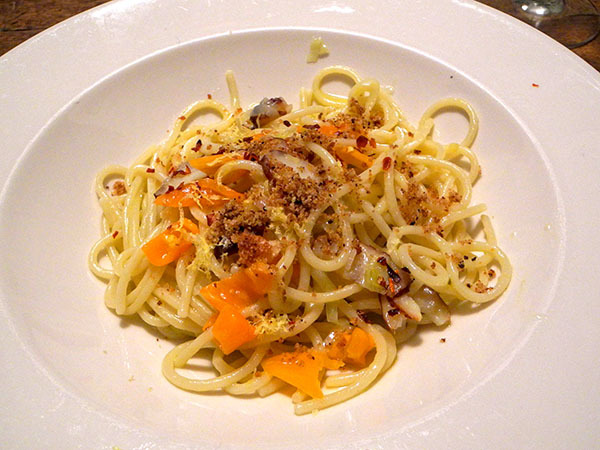 This simple looking dish of pasta far exceeded both of our expectations. I haven’t been posting on this blog lately, because we’ve been very busy trying to get the apartment ready for friends who will be staying here while we are in their Berlin apartment. I’m making an exception for last night’s meal, because it was extraordinarily good (the flavors amazingly balanced), because it was pretty much an accident (I mostly trying to just put together something for dinner using fresh supplies that were otherwise going to be wasted), and because it was very much a collaboration with Barry (there was a real conversation throughout its development). If you have access to the ingredients, and if you can take a few minutes to reproduce what we did, you will probably never forget this meal. If it helps, I can’t imagine why almost any smoked fish wouldn’t work just as well as the monkfish that I happened to have in the refrigerator.